How many times has this happened to you? Your neighbor, that attractive person you’ve been desperately wanting to meet for months, comes to the door and asks to borrow a couple of oranges. You think, “Shazam! It’s my lucky day.” Immediately agreeing to help, you dash to the refrigerator to retrieve said oranges only to find your refrigerator stocked entirely with onions. Many years ago, back when Saturday Night Live was funny, Martin Short did one of his Ed Grimley sketches in which Tina Turner showed up at Ed’s door asking for oranges. If you didn’t sleep through that first paragraph, you can guess what Ed found in his fridge. Sometimes that’s how I feel when I go to the kitchen in search of food. In my case, my frustration usually arises when my food-snarfing son has gone all conehead on me and consumed mass quantities of whatever I had counted on finding, but the lack of healthy, edible food is a significant obstacle to successful eating. 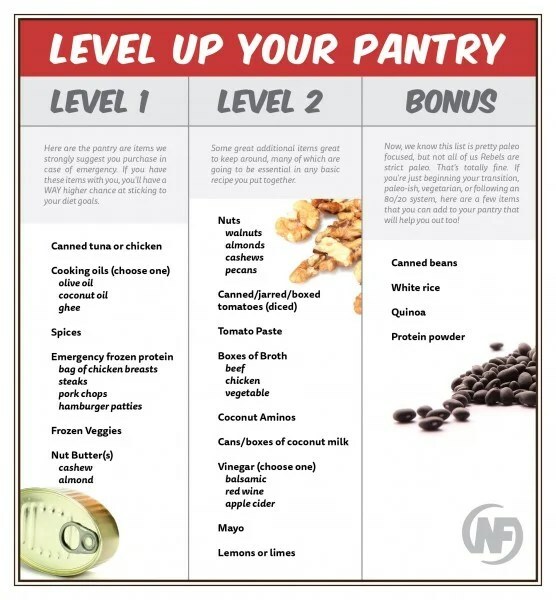 That’s why I was so pleased that the guys at Nerd Fitness determined to take the common sense approach of describing the Nerd Fitness Pantry. The idea here is to have a flexible selection of ingredients that will keep you from finding your refrigerator full of onions when hunger strikes. In normal Nerd Fitness style, the piece is presented using a video game comparison. Each item youll be gathering on your grocery store mission is like a tool used during questing for one or more purposes. Think of coconut oil like the hook shot in Ocarina of Time: its going to take some effort (and real-life rupees) to obtain, but after you have it, youll be using it all the time. Others items are like potions, great to keep around in case of emergency (like if you didnt have time to cook before work). This longish entry on the NF blog goes into a lot of detail on both what you ought to buy but why you ought to buy it. It prioritizes things and takes the incredibly commonsense approach of pointing out that you can vary the list to suit your own needs and wants. They even provide a handy chart. Penny and I have been working on stocking our kitchen in just such a manner, although with different details. What we’ve found is that by having the raw materials on hand, we’re able to eat healthier and waste less while we resist the temptation to throw up our hands in frustration and order a pizza. This sort of planning just seems like good stewardship all around.